The Future of the Sugar Plantation is in Our Hands! Come be part of launching this new Voters Initiative Law. Join your fellow citizens in activating your constitutional right to invoke the process of converting the sugarcane plantation from corporate to public ownership. Through the special purpose revenue bond system, these lands can be purchased by the community, at fair market value, costing the government and the people nothing. These new publicly-owned Community Organic Farmlands will create more jobs and a thriving local economy. These lands will be dedicated to diversified regenerative agriculture to protect the Aina, feed the people of Maui and Hawaii, and achieve food security. Malama aina, healthy land, healthy people. Together we can create a bright and healthy future for Maui! Sing the petition today by visiting one of your local neighborhood businesses. > Have enough public farmland to ensure food security for Maui. > Have more jobs (and money) on Maui boosting the economy in every sector. > Have farming that doesn't compromise the health of the people and the Aina. 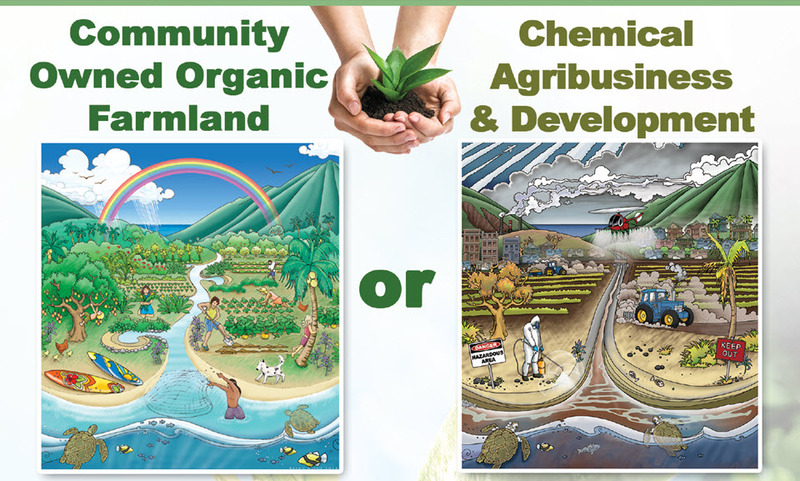 > End the chemical drift and run-off from chemical forms of agribusiness. > Save our Honu from the chemicals. Healthy Honu, healthy people. 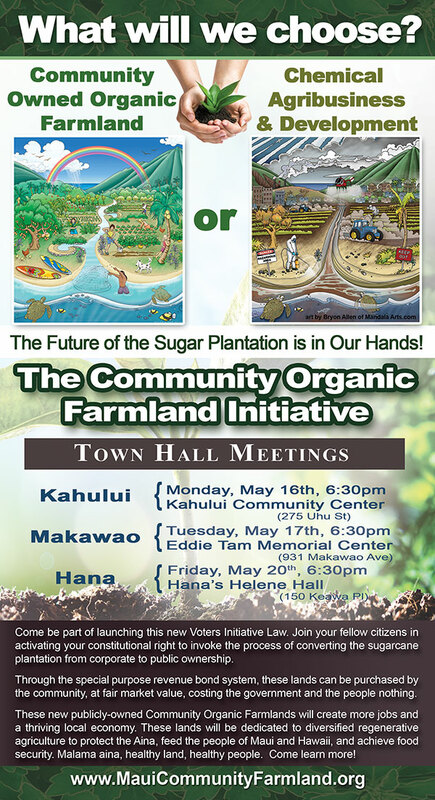 An introduction and overview to the Maui County Community Organic Farmland Initiative in 6 minutes, a plan to convert the sugarcane plantation from private to pubic ownership by paying fair market value for the land using eminent domain, and dedication these new community lands to organic and regenerative agriculture to feed the people of Maui and Hawaii. 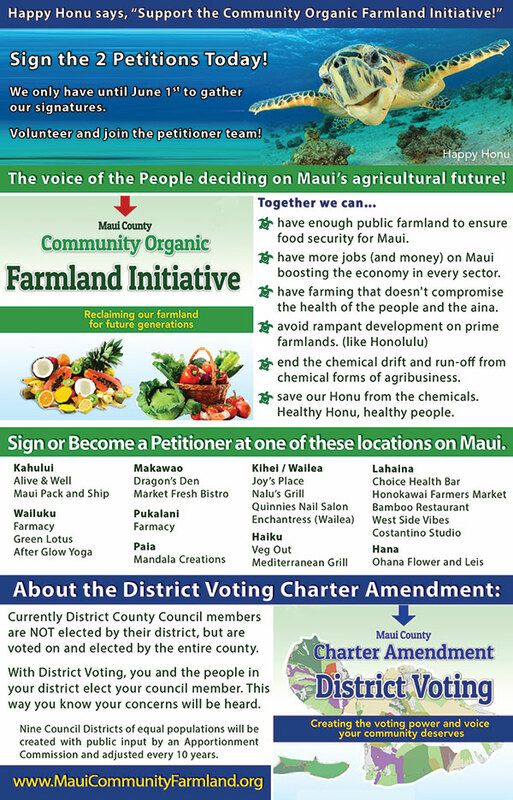 The Maui County Community Organic Farmland Initiative is a proposed Initiative Law that invokes the right of Eminent Domain to convert farmland from private to public ownership by paying "fair market value" for the land. These new Community Organic Farmlands will create more jobs and will be dedicated to regenerative, diversified agriculture to feed the people of Hawaii.